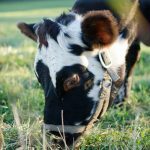 Is it wrong to give a dairy cow feed with grain? 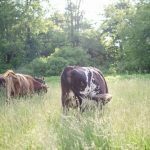 The rage is all about 100% grass-fed dairy, but we’re giving our family milk cow grain and here’s why. What kind of a self-respecting Cow Mama am I, exhibiting my poor gals before the proverbial world and pointing out all the imperfections in their body conditions?! Do you think they’ll forgive me because it was for educational purposes that I showed you that Holly is on the skinny side, Candy & Stella are just about all that we could hope for, and that “Big Bertha” has earned her nickname thanks to her prodigious hips? What impresses me so much about “Big Bertha” is that she looks like that... without the grain bucket! 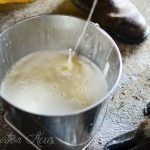 When we homesteaders, newbie dairy farmers, and the like go family milk cow shopping, what we need to understand is that we might just be getting what we paid for! Holly was 1/3 the price of her counterparts on the dairy cow market. She was a cull cow, we got a great deal, and we needed it. She was bought to be a nurse cow for our calf whose mama died and Holly made a wonderful adoptive mother. I am so appreciative of the role she has played in our homestead story that she will have a home with us until the day she too dies. But we’re going to pay for it. You see, in order to keep her healthy, yes I said healthy, we’re going to have to give her a grain ration as part of her cow feed. At times it might be more, at times less, but we’ve accepted the fact that her recent ancestors were most likely selectively bred to have increased milk production. Rumor is she might even have some Holstein blood coursing through her veins. She’ll still give most of all that milk she was bred to give even if we don’t give her grain. She’ll just take it from herself. And I think that’s what we’re seeing reflected in her body condition. When Holly came to us, she did so from an organic dairy farm with a 12 pound-a-day grain ration. Six pounds, twice daily, at milking. When she freshened this year, we decided to see how she would do with that cut in half and then after bringing on Stella & Candy, she’s been getting a lot closer to 3 pounds of grain like her new pasture mates. While that amount has worked for them, it’s not cutting it for Holly so we’re are increasing her ration back to the six pounds. We’ll observe her for a while, and if need be raise it AGAIN! Like it or not, trendy or not, it’s not fair for us to deprive her of that energy source. Right now “grass-fed” is a major buzz word among those of us trying to eat better for our health and the health of our children. And rightly so. The attention given to “grass-fed” cattle is in response to cows being fed diets they were never intended by the Creator to eat: All grain, gummy worms, chicken manure, dead cows. These are things that, left to themselves, cattle would never choose to eat! There has been enough public demand that producers, such as Organic Valley who now has a “Grassmilk” line, are listening. Supporters of the wonderful Weston A. Price Foundation are often the most vocal opponents to grain in the diets of ruminants (indiscriminate of beef or dairy genetics). What you’re actually seeing in all this outcry is the pendulum swinging to the opposite extreme and completely disregarding the very definition of grain… which are the seeds of grass. Yes, corn is a grass! I think many would be quite surprised to find that on Sally Fallon Morell’s farm she feeds grain to her dairy cattle. But even if she didn’t, the fact of the matter is that we’re not answerable to the Weston A. Price Foundation supporters or any other person or organization, or even our customers (much as we love them and are thankful for their support) for how we raise our cattle. God is the foremost farming “expert.” He is the source of all wisdom. He not only designed and created everything, but He planted the first garden. It makes sense that the best farming is going to be based on God’s wisdom, not man’s. The infinite knowledge and understanding that backs up Gods designs and models makes the knowledge of an agricultural scientist seem insignificant. Thankfully for us, God has revealed His wisdom to His people through His Word and Creation. These are the sources we need to look to when we are trying to learn how to farm. Wonderful. We see cattle eating grass. Where’s the discrepancy?? Sure, while the overwhelming majority of verses in the Bible show us a pastoral image of cows eating grass, is that an ox I’m seeing snacking on some corn while it’s working? Sure is. So not only do we see a cow here instinctively eating something it enjoys and was created to be able to eat (or it wouldn’t) but what you don’t see is God’s prohibition on our allowing a milk cow to eat what their natural desires cause them to eat. 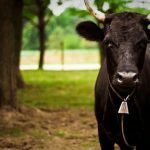 And while I realize that these verses aren’t actually talking about *how* to treat cattle, God is using a parable to help us to understand a much larger truth, as farmers so far removed from proper animal husbandry techniques we can still turn it around backwards to learn how to care for His creation. This is why we, as Christian stewards of our cattle, ought to be attentive to their condition while we take a long term vision at selecting cows that will do better on grass and improving our pasture. We should NOT be shopping at the sale barn. We should NOT be getting whatever cheap deal comes our way! If grass-only is our goal, then we need to seek out the genetics to support our ideals! When “Big Bertha’s” first heifer goes up for sale, you’ll see me fist fighting at the front of the line like a WalMart shopper on Black Friday to get dibs on her! We should NOT expect to bring home our new family cow and turn them out onto our small acreages with limited to no access to the best grass (our first cow literally ate off our lawn) and expect them to thrive… and give milk while we neglect making pasture improvements such as planting seed or clipping weeds whether with sheep, scythe, or tractor, and expect her to do that without any help from grain! We should NOT be ungracious and condemn or guilt trip our fellow homesteaders and dairy farmers who supplement with grain for considering the health and well-being of their animals before and above a trendy principle no matter how worthy the grass-only standard might be. Besides. Have YOU ever tried to herd a cow that isn’t bucket trained? It ain’t fun! Girl doesn’t go where she doesn’t want to go until she’s good and ready to! Your Questions: Can I Own a Dairy Cow (Or Goat) AND Still Have a Life? I loved this post. I totally understand you and think it is very nifty that you used scripture to make your decision. And you got counsel, like from Scott Terry and Noah Sanders and your own experience. That is as it should be. Keep up the good work! When He created it, it was a grass, now I don’t believe it is. When we feed grain, its oat, barley or rye grass fodder or just simply sprouts. We have seen great results and it really doesn’t take much time at all. I appreciate your article and I agree we shouldn’t criticize others. I hope that I didn’t come across that way. Just wanted to share my opinion. The last 2 posts have been so timely for us. We’ve struggled with balancing our first calf heifer’s ration. She continues to stay on the slim side, and our local sources for feed is very limited. I’d like to know more about sprouted grains, and soaking grain in vinegar. Lately we have used our own mix of sweet feed, oats and beet pulp with added alfalfa hay to up the protein. She gets aged grass hay as our pasture wanes towards winter. Your heifer is blessed to have a Cow Mama who cares so much Abbie! I know the struggle of finding local sources- it can be rough! Until the last year or two we couldn’t even find gmo-free. It sounds like you’re doing real well for her despite the difficulties and I hope you find the information and sources you’re looking for. It’s eye opening to think of the healing we need to work toward, for our animals and our land. What has been done, can’t be done overnight. Walking back toward the Lord takes just as many steps toward Him and we took away from Him. I’m thankful He is merciful! I love your scripture references! We just brought home our first dairy cow on Saturday (and her bull calf), and to say that your last two posts have been great timing for us, would be an understatement. Thank you, Quinn! I purchased my first Guernsey dairy cow in May. I told the previous owners of my plan to only give her a little grain when I milked and they said that she’d do just fine. But then she arrived on the farm under conditioned and calved two weeks later. My plan for a little grain…is now up to 12 pounds a day just to keep her from losing more weight. There is no way my cow could go without grain. I wish she could, but it’ll never happen. I definitely learned a lesson to take with me when/if I buy another milk cow. I’m real glad to see you’re willing to sacrifice your principles for the sake of your cows health Melissa. It’s sad, but some aren’t. I’ve just gotta say that I sure am tired of seeing “previous owners” saying what they’ve got to say in order to get a cow sold! It’s shameful. Our first one came to us bred and dry and it turned out she was open & lactating. I grew up on a Dairy Farm for the first 13 years of my life, and once we sold the dairy cows, Dad let me keep a couple of my “pets”. Once a day I milked Darling while Gale babysat the calves. What a lot of dairy farmers that I know of in Alberta (Canada) do is they feed their cattle silage. It is chopped up green grain. So before it gets to the point of harvesting, it is chopped into tiny pieces, then pack down with a tractor, and covered with plastic and left to ferment. This helps their digestion and lowers the amount of grain they need. The cows got a some grain sprinkled on the silage during feeding time and then a little bit more when milking. I do not know the exact amounts. Grain was a treat.They also got lots of hay and in season grass. Dad was also a big believer of only treating the animals with penicillin. We had a very healthy herd by the time it was sold. It really was. I miss a lot of parts of the farm. You can do it on a smaller scale, but might be more work. You would need something to chop the grain or grass, then something to pack it and then a place to cover it and let it ferment. The easiest way would be to talk to your neighbor and see if they would be willing to sell you some. I also know that there is a certain amount of water needed for proper fermentation to maintain proper nutrition. I met a diary farmer that had a silo and did this very same thing. She told me the cows love it. They used dent corn. The whole stalk and the corn. Quinn, this is such a lovely post! I was actually thinking of Mr. Terry’s show as I read along, since I heard that too and agreed fully with him in the statement you quoted. We cannot expect animals that have been breed to ‘thrive’ on grain for so long to do well without it. I admire you for fighting the moderate grain fight and for showing us your girls in less than perfect conditions so that we can learn from it. My granddad had 13 jerseys back when that constituted a milk farm – he taught me a lot, even though I was born long after they sold the farm and one thing was that things are never ‘perfect’ on a farm! And to Janelle, my granddad fed silage too, with great results. He sure had a lot of wisdom and common sense to share in that episode! We’re very thankful that he takes the time from his no doubt busy schedule to stay up and do the show every week! And thank you for leaving such an encouraging comment. It was a difficult post for me to write knowing that it is most certainly such a taboo thing to do right now. I feel so blessed by his show and all the people coming on and sharing their insights. We always have to remember that we answer to the Almighty, not to fickle human ideas. I say that to myself all the time, and little does it help. But we have to stick by what is best for the animals (or what ever the case may be) and then not worry about what others do and think. Your post was a much needed voice in the sea of no grains. I loved this post. We as consumers have no idea how cows are raised. We simply insist on grass fed. I never thought about the genetics involved. Thanks for enlightening me. As a side note, can you feed your cow alfalfa? Thanks Anna 🙂 They can eat alfalfa (although our first cow wouldn’t touch it not in bales or pellets- even when we cut her grain ration with alfalfa pellets somehow she was able to leave all the pellets behind!). And it’s possible that a quality high protein forage would help with body condition, but the only way to truly determine quality would be to have it tested which obviously isn’t feasible on our level. I would think that once the grain was used for quick energy and body condition turn around that alfalfa might be an option for maintaining it and cutting the feed bill. You could grow your own non-gmo alfalfa too and get several cuttings. I grow 2 really small patches and it comes back every year but has some holes in it. You can’t overseed it since it won’t let seed grow. You would have to use plugs. I admire you for giving your animals what you think is best for them, rather than adhering to rigid dogma. Studies suggest that products from grass fed animals have the best fat profile for human health, BUT, we humans hold farm animals captive, so I believe their health and happiness come first. If that means adding a little grain to the diet, then add the grain. I buy our milk and yogurt from farms which also provides a small amount of grain to their cows, because they feel the cows are happier and healthier. I don’t resent it one bit. 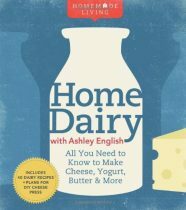 I am happy to have dairy products from happy, healthy animals. I appreciate you as a consumer being so understanding, despite being knowledgable about the health benefits of the milk when it’s “grass-fed!” And I’m sure your farmer does too! Great article! We raise dairy goats and we just bought two dexter heifers. I’ve been toying with feeding them less grain, but our does just get too skinny and milk production drops off the table, which isn’t cost effective for us or healthy for them. In light of this, I think I’ll throw away the guilt and just try to find the best, healthiest grain mixture I can get in order to nourish them properly. Good for you! I’m glad you’re able to recognize what your girls need and be willing to go against the grain (hard-de-har-har!) to give it to them! We were analyzing Holly really carefully day before yesterday and this is working for her! She’s not quite as bad as she was and going into winter, that’s saying something! We would have been pleased to maintain! Congratulations on your growing herd! I LOVE this. Treating your animals correctly, instead of trying to fit then into a mold is so important. We bought a milk cow from an organic, has fed only dairy. She was so thin that every bone in hey body was noticeable, yet they didn’t want to feed her anything ender because it would have ruined their idea of the prefect milk. So sad. Aw… poor gal! I’m glad she now has a home where she’ll be well cared for!! Hi. Sweet article. Well done! Yeah, God thinks cows can have some grain when they’re working! And the modern dairy cow is working hard. She is built to produce a whole lot of milk and her body expects more than so-so pasture. With careful cow selection and excellent management, 100% grass fed is possible and can be quite desirable for a farm economically. If I understand correctly, all milk has good fats. Grass eating promotes a higher percentage of them. Homestead cows who graze and eat hay are way ahead already, and so are the folks who drink their milk. We humans can get even more good fats in our diet from sources like fish. So, if that information is correct, I’m not sure there is a pressing human health reason for a family cow to be 100% grass fed. There certainly is a pressing reason to care for our animals and keep them healthy! That will mean grain for very many cows at the moment. I expect we’ll see more and more experimentation, knowledge-building, and breeding that allows for less grain. Corn is a starch, and starch turns to sugar in the body. Corn in the Bible isn’t the corn we think of. Corn we call corn is maiz. It’s a New World plant, they didn’t have it in the Middle East in biblical days. Corn also means grains like wheat and rye, and that’s what the Bible means as corn. I don’t think corn (maiz) is that good for cattle. 1. A single seed of certain plants, as wheat, rye, barley and maiz; a grain. It is generally applied to edible seeds, which, when ripe, are hard. 2. The seeds of certain plants in general, in bulk or quantity. In this sense, the word comprehends all the kinds of grain which constitute the food of men and horses. In Great Britain, corn is generally applied to wheat, rye, oats and barley. In the United States, it has the same general sense, but by custom, it is appropriated to maiz. Be that as it may, corn or maize, is still an excellent source of affordable and available fuel and energy to an animal who is in need of conditioning. The principle is that grain is being fed to cattle and not 100% grass. I never meant to imply that we ought to import middle eastern grains for our cattle in order to be biblical. hmmm… lots to think about… I believe in taking good care of what God has given us, but part of doing that is culling our herds to be healthy, economical and moving in the right direction. So, we need to be careful not to justify a bad habit. 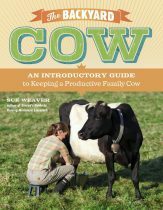 I have struggled with this starting out myself, as there is not much choice when you only have a few animals… maybe continuing to use the offspring as the new milk cow as we lower rations and work on our pastures, if you only have one cow. Starting with a grass oriented breed is a huge stepping stone. I was blessed with a Red Devon that fell into my lap (actually 2 heifers)… I gon't take credit for choosing this breed, I was obvious that the Lord set it up… However I don't think this cow does as well as I would like and the pasture isn't as good as I want yet… So I plan on making the offspring the new milk cow and the now cow breeding stock. I have a question to you and all the people commenting. Are you drinking/selling the milk as raw milk? I have my guess that big dairies can’t do raw milk or it would be a serious health problem. If you feed a lot of grain the cows ph in its gut becomes more acidic and the bad bacteria get accustomed to this and so when you drink this milk raw the acids in our stomach wont kill it because it is already used to surviving the high acidity in the cows gut. I’m sure a little grain is just about right in my opinion. But big dairy… I don’t know. How much grain are they pushing those animals to produce? Any experience out there? I’ve heard of people feeding grain while selling raw milk and some got sick. Rare, but still a question out there for me. I’m sure YAHUVEH God didn’t expect us to feed only grain either for that is nowhere found in nature. Something in between Moderation/temperance I believe is ideal. Great scripture study you did! Its nice to see a remnant in America still believe in God! Yeah, I would never drink raw milk from cows that were solely grain fed. Frankly I’m not too sure how I feel about drinking any milk that was intended for pasteurization.